We previously reported that Ali Nejati was prosecuted 6 days ago, just 27 days after being released from jail, on charges of “travelling to Kurdistan and singing” a very popular Lori “oldies” song called “Daya daya,” which the regime has all of sudden found provocative. These harassments must stop. 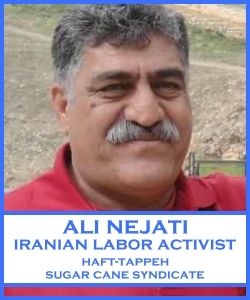 Mrs. Sagvand’s real “crime” is supporting and defending the innocence and rights of her husband, Ali Nejati, an elected board member of the Haft-Tappeh Sugar Cane Syndicate, and nothing else. The Islamic barbarians are losing control and desperately use the most ridiculous “excuses” to harass labor activists and their families. Towards an Iranian Workers’ United Front. Down with the Anti-Laborer Regime of Islamic Republic.